It’s always fun to look through photo donations because you never know what you’ll find—and learn. In looking through a batch of images donated by LeAnn Ritter Underwood I came across a photo which made me laugh out loud. A pig nosing a vacuum cleaner! The collection belonged to Mrs. Underwood’s father, Roy C. Ritter (1908-2001), who was born in the Wheeler community of Washington County. Ritter began raising turkeys and broilers in Springdale in the 1930s, just as the poultry industry was getting started in Northwest Arkansas. The broilers raised at his Arkansas Quality Farm were served at his A. Q. Chicken House restaurant, founded in 1947. He also opened Quality Feed stores and hatcheries in Springdale, Rogers, and Harrison. Ritter was a leader in the poultry industry, both statewide and nationally, serving as president of such organizations as the Arkansas Poultry Federation, the National Turkey Federation, and the National Broiler Council. Ritter was also a community leader, serving as Springdale mayor in the 1970s. So why the pig photo? It took a few Google searches before I came across a reference in C. James Goodwin’s 1999 book, A History of Modern Psychology. In it he wrote about the work of Keller and Marian Breland, who, as graduate students during World War II, worked with noted psychologist B.F. Skinner to train pigeons to guide missiles. 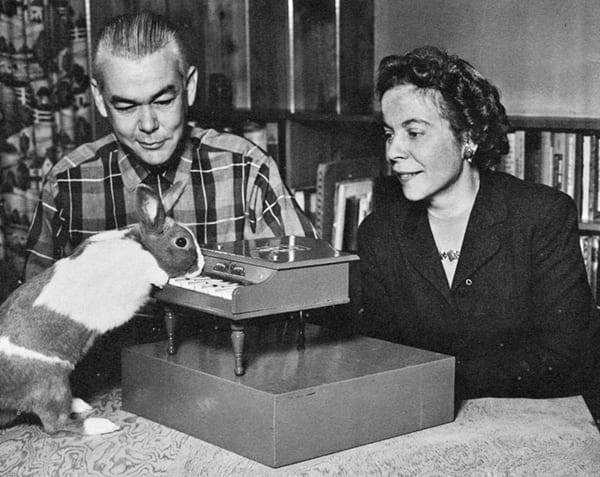 After graduate school the Brelands opened Applied Behavior Enterprises in Minnesota, training animals for entertainment and commercial purposes. Their first contract was with General Mills, teaching hens to tap dance as a way to advertise the company’s Larro Farm Feed. 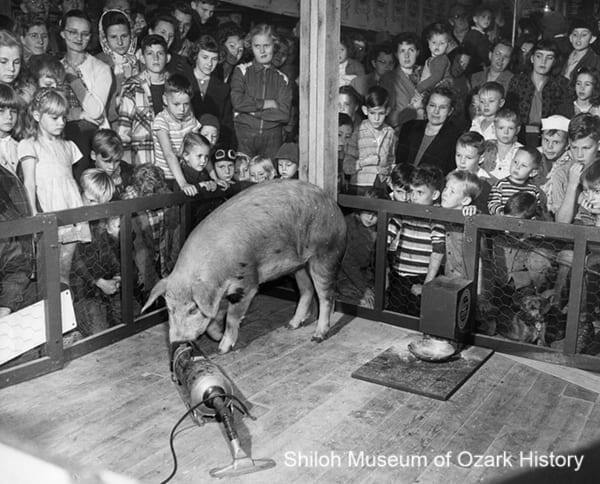 Their success led to “Priscilla the Fastidious Pig.” According to an article about the Breland’s training methods, not only could Priscilla push a vacuum, she could turn on the radio, put clothes in a hamper, eat breakfast at a table, answer quiz questions, and select her favorite food—Larro, of course—from that of competitors. From 1948 to 1950 Priscilla performed her act at feed-stores, county fairs, and on television. Except it wasn’t the same Priscilla. Every few months, as Priscilla grew in size, she was replaced by a new trained pig, one that was smaller and easier to ship. Comparison of the stage and fencing in the Ritter photo with similar photos on the Internet help ID this pig as Priscilla, along with the feed box with its Larro decal. A notation on the back of the photo reads, “Frame and send to Quality Springdale,” suggesting that the photo might have been taken by a Larro representative at one of Ritter’s Quality Feed stores. 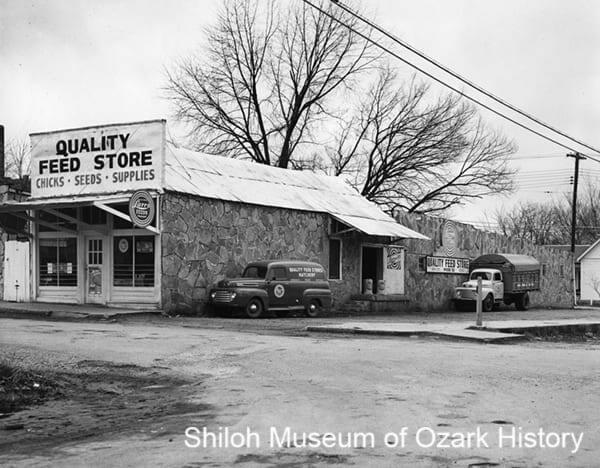 There’s another Arkansas connection to this story, as I discovered by looking in newspaperman Ernie Deane’s extensive research files, donated to the Shiloh Museum by his daughter Fran Deane Alexander. In the early 1950s the Brelands moved their company to Hot Springs and opened the I. Q. Zoo in 1955. Visitors could watch such animal acts as piano-playing cats, drumming ducks, high-wire hens, and basketball-dunking raccoons. The critters were trained through “operant conditioning,” a type of animal psychology which encouraged specific, desirable behaviors with food rewards. So as a result of one funny photo I learned about Priscilla, the Brelands, and I. Q. Zoo. Who knew?